You're going to need to buckle your seatbelt when reading Swords of Sorrow #2. If you've already opened the book you may be too late because it grabs you by the throat and never lets go. You're going to get swept away in a fast-paced adventure that you're going to want to read a couple of times to take it all in. Red Sonja has her hands full with Tars Tarkas and soon an epic showdown with Dejah Thoris takes place that is the centerpiece of the issue. 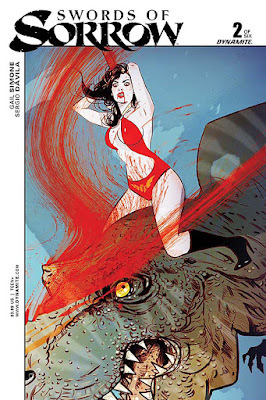 Meanwhile, Vampirella is on the run from a T-Rex. The ladies of classic pulp fiction are knee-deep in danger and it's what fuels this series so far. The danger of course, comes from a common enemy even if our heroines don't know it yet. The Prince has amassed his own squad of pulp villains like Purgatori, Chastity, Hel and Catherine Bell to face these chosen warriors of The Traveller. A choice that is leaving her Courier less than impressed. "They are not heroes, Mistress. They have wickedness in their hearts...and they squabble rather than combine," he tells her. The Traveller is undaunted in her brigade of powerful women. "You said it yourself, Courier...we're asking them to squabble," she replies. Her team is still crossing times, eras and dimensions to come together. They haven't realized yet how important their mission is as they've been fighting amongst themselves so far. This is where Sergio Davila takes Gail Simone's story to another level with extremely detailed and cinematic art. Davila has his work cut out for himself as the action is swift and constantly shifting to another heroine. He must then inject panels that reference other heroes who are not yet fully integrated into the story. It's quite the balancing act, but Davila keeps his foot on the gas with amazingly well-staged action sequences. Jorge Sutil's colors add buoyancy and lush contrast between the characters. Simone's characters all come across well, but there's no denying Red Sonja's star power shines brightest in Swords of Sorrow. Perhaps the most well-known of Dynamite's female pulp stars, the she-devil is a funny and relentless warrior. If you like adventure and cinematic action then get on Swords of Sorrow now.